Editor/Author Andrews, Richard, Borg, Erik and Davis, Stephen Boyd, et.al. 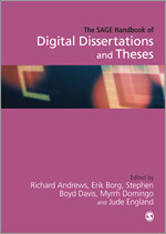 This handbook sets out the processes and products of digital research. It is a theoretical and practical guide on how to undertake and navigate advanced research in the arts, humanities and social sciences.